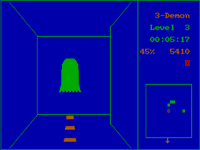 3-Demon (also known as Monster Maze, though not to be confused with 3D Monster Maze) is a wireframe 1983 DOS computer game based on Pac-Man. The player wanders through a 3-D maze, eating pellets and avoiding red ghosts. Eating a power pellet turns the ghosts green and gives the player the ability to eat them for extra points. It is a notable example of an early video game told from a first-person perspective. Source: Wikipedia, "3-Demon", available under the CC-BY-SA License.